With the increased availability of clinical 3 T MR scanners, high expectations are set for coronary MR imaging in terms of scan time, resolution and image quality. The feasibility of performing contrast-enhanced whole-heart coronary MRA at 3 T has been demonstrated recently . High signal-to-noise ratio, contrast-to-noise ratio, and good image quality were consistently achieved on volunteers with 3D inversion-recovery-prepared FLASH and slow infusion of high-relaxivity clinical contrast agent. No clinical results using this technique at 3 T were available so far. The purpose of this study was to evaluate the clinical robustness and diagnostic accuracy of whole heart coronary MRA at 3 T in comparison to X-ray coronary angiography. To evaluate the diagnostic accuracy of contrast-enhanced whole-heart coronary MRA at 3 T in patients with suspected coronary artery disease. Twenty-two patients (64 ± 10.2 years) with suspected coronary artery disease underwent cardiac MR examination at 3 T (MAGNETOM Tim Trio, Siemens, Germany) after informed consent was obtained. Coronary arteries were imaged using an ECG-triggered, navigator-gated, inversion-recovery, segmented gradient-echo sequence with isotropic whole-heart coverage. A twelve-element matrix coil (six anterior and six posterior) was used for data acquisition. To speed up data acquisition, parallel acquisition (GRAPPA) was used in the phase-encoding direction with an acceleration factor of two. Imaging parameters included: voxel size 0.65 × 0.65 × 0.65 mm3 (interpolated from 1.3 × 1.3 × 1.3 mm3), TR/TE = 3.3/1.5 msec, flip angle = 20°, bandwidth = 700 Hz/pixel, imaging time = 8.8 ± 1.9 min. Contrast agent (0.2 mmol/kg body weight, Multihance, Bracco Imaging SpA, Italy) was intravenously administered at the rate of 0.3 ml/sec using a Medrad power injector. All patients received x-ray angiography (CAG) within 1 week after coronary MRA. The CMRA and CAG data were blinded and reviewed on a segement basis by two radiologists. The accuracy of 3 T coronary MRA in detecting coronary stenosis on segment basis was evaluated using X-ray angiography as the reference. There are 186 assessable segments, and 12 segments could not be analyzed by coronary MRA. 23 segments with significant stenosis (>50%) were correctly diagnosed by MR. The sensitivity, specificity, positive predictive value, negative predictive value and accuracy of coronary MRA on a segment basis were 85.2%, 96.9%, 82.1%, 97.5%, and 95.2%, respectively. 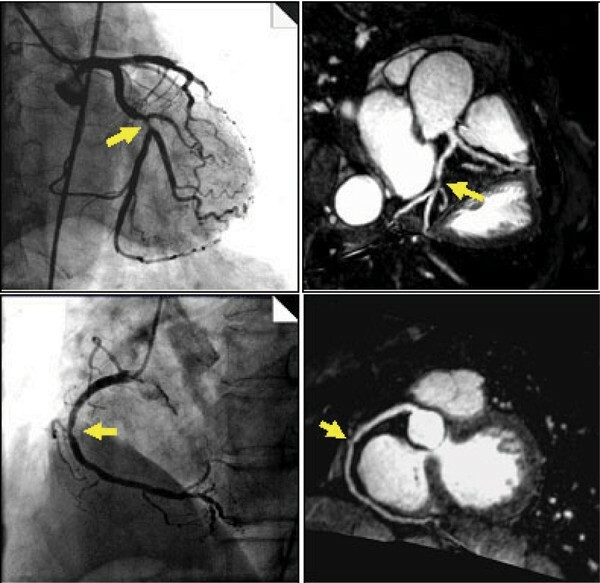 Figure 1 and Table 1 show reformatted coronary MRA images and reference X-ray angiography from a 75-year-old patient. The stenosis in both left and right coronary arteries are well depicted (arrows). Whole heart coronary MRA using a slow infusion 3D IR-Flash technique at 3 T was performed in 22 patients with suspected coronary artery disease and compared to x-ray coronary angiography. Diagnostic accuracy of whole heart coronary MRA. 3 T whole-heart contrast-enhanced coronary MRA showed good diagnostic accuracy for detection of significant stenosis. The results of the study in sensitivity, specificity, PPV and NPV fall into the lower range of reported values from recent CT literature . These results justify optimism that further improvements in spatial resolution and imaging speed may lead to clinically acceptable coronary MRA examinations .